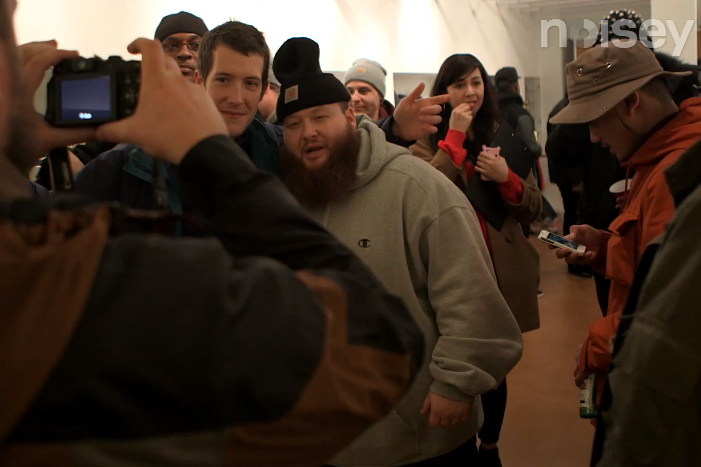 Back in December, Queens Native Action Bronson made his way to London for a couple of days, managing to squeeze in 3 shows, a few interviews and a bit of shopping while in town. The folks at Noisey were shadowing his every move, documented in the short film above – 48 Hours with the man himself. Bronson was in London for one of two Mean Fiddler presented tour dates, with his first show in the capital taking place at the Garage on Sunday December 16th, where he roamed the entire crowd throughout the performance, ensuring everyone got a bit of the action. The following day he performed for a small crowd of 50 at The Candy Store (which I was very lucky to be a part of), before heading to the Old Blue Last for his final show of the trip. The film follows Bronsolini as he meets Tim Westwood, eats at Soho’s legendary Jerk City spot and stops at size? Carnaby Street to pick up some more New Balance. He is straight up one of the funniest and friendliest artists I’ve had the pleasure of meeting and an extremely entertaining performer, with each of his shows a unique experience for those in attendance. I’m already eagerly awaiting his return to London later this year. Check it all out above and head to Noisey for more of the ‘Noisey Raps’ series. Tickets for Action Bronson’s June 7th show at Koko are available here.